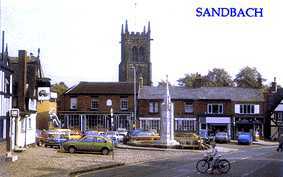 Located just over a mile from junction 17 of the M6 motorway, Sandbach nevertheless has the appearance and feel of a tiny market town in the countryside. The town has adequate free parking on Scotch Common (except Thursday - market day) and on the car park below the Waitrose supermarket. The cobbled square (below left) with cenotaph and ancient stone crosses has parking for disabled only. Most of the pictures in these pages are from Post Cards which were bought from the Post Office in Elworth village. 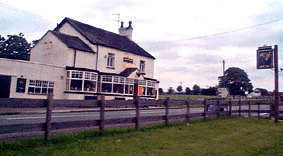 Elworth is just one kilometre outside Sandbach on the Middlewich road. It is an easy walk or you can drive. Parking is somewhat limited. although there are five parking spaces in front of the Post Office and room in the adjoining side streets. Elworth is the site of the original Foden offices (now demolished after being damaged by fire and flood) and has several friendly "corner shops" where you can buy newspapers, magazines, food and confectionery. The Railway Station is at Elworth and links directly to Crewe and Manchester. The Stone Crosses are 1,300 years old and are covered in markings which have still not been fully deciphered. Sandbach Town provides an excellent base for you to see the sights of Cheshire, Staffordshire, Shropshire and North Wales. Before you drive away, however, take a walk around the town which has numerous shops and interesting buildings. Thursday is market day and attracts hundreds of visitors. Saturday provides a smaller market which leaves Scotch Common free for parking. 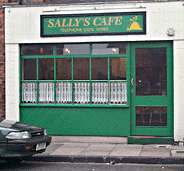 Sally's Café in Green Street, just opposite Scotch Common car park, provides nice meals at affordable prices. The proprietors also offer an outside catering service for weddings and parties. 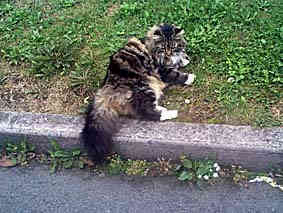 Not so attractive are the gutters which support weeds - in some places two feet high! In addition, many pavements are in a dangerous state with the concrete slabs cracked and collapsing - a combination of attacks by burrowing ants from below and uncaring drivers who park their vehicles on top. I see elderly people walking in the road because they are afraid of tripping on the footpaths. We shouldn't blame the council. It takes less than an hour per month in the summer to keep these areas free from weeds. Do you bother to do this and are you one of those drivers that is ruining our footpaths? And another point: we now have cycle paths but can cyclists use them? No, because there are other vehicles parked across them. Is there any wonder that cyclists use the footpaths? This is awful - tell me more. The Canal Centre at Hassal Green includes a shop, restaurant, post office and a pleasant grassed area by the canal. Potter's Barn which is nearby. Also close to the Canal Centre is the Romping Donkey pub which is a NO SMOKING establishment and currently (2005) serves delicious carvery lunches from noon till 2pm. The Potteries around Stoke-on-Trent is just down the motorway off junction 16. Visit the many factories in this famous area. Tatton Park near Knutsford is about 30 minutes drive. Delamere Forest, about 30 minutes away, offers pleasant walks through the woods and has two cafes on the main road, one in the old railway station and one at the crossroads. Dagfields Craft Centre is out in the wilds between Crewe and Nantwich. Interesting shops include Decorated Ostrich Eggs (closed 2004) and Wooden Toys. Two cafes provide food and drink. 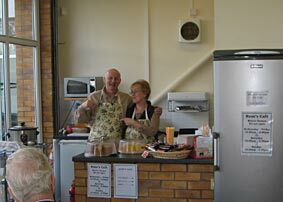 Blakemere Craft Centre and Fleamarket is near the A49 junction at Sandiways near Northwich. Browse the shops, eat in the superb restaurant then take a walk through the woods. About 30 minutes drive. The Railway Museum at Crewe is just 10 minutes drive. Stapely Water Garden near Nantwich is about 30 minutes drive. Congleton is just 20 minutes drive on the opposite side of the M6 motorway. An ancient market town, Congleton provided silk, ribbon and fustian factories, tobacco manufactories, iron and brass foundries. Nowadays most of the factories have been replaced by service industries. Interesting surroundings include the river Dane, Town Hall, St. James Church. Biddulph Grange is about 30 minutes away and can be reached via Congleton. The superb gardens are arranged in Egyptian, Chinese, Scottish and other themes with pleasant walks and a small cafe when you need refreshments. Entrance fee. National Trust property. 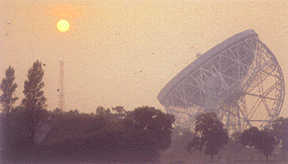 Jodrell Bank radio telescope and science museum, with planetarium and arboretum near Holmes Chapel, is about 20 minutes drive from Sandbach. The Catalyst Science Museum at Widnes is about 1 hour away. Manchester Science Museum is about 1 hour away. Chester Zoo is about 50 minutes drive. Ellesmere Port boat museum is about 1 hour drive. Eureka Science Project! is about 1 hour away (in Halifax - use M6 north, then M62). Chester is about 40 minutes drive. If you like vintage radios, be sure to visit the museum. Shrewsbury is one hour away. This used to be "The Shrewsbury Quest" where you will find a large car park. The building is now (2005) an exhibition centre with free entry. Shrewsbury itself is a tourist town like Chester and many interesting shops are open on Sundays. See the mixture of old and new architecture - often anachronistically alongside each other. Tardis Mobile Electronics in Crewe - will repair almost anything that uses electricity! Also specialises in electrical fitments for motorhomes and caravans - aerials, satellite, radios, alarms, electric steps, etc. Cheshire Home Design in Crewe - will extend or improve your home as you want it. Click on this map to see a larger area map and links to other related sites!